For a jaded filmgoer and film festivalgoer like me, surprises can often be few and far between. Whether it is the latest Hollywood super-spectacle or the most obscure, experimental art film, most films nowadays are variations on the familiar and endlessly overdone. So it is quite a pleasure to come across such a film as Roh Gyeong-tae’s “Land of Scarecrows,” a true masterpiece whose elliptical, initially challenging style is nevertheless eminently accessible. Roh’s second feature, which shared the New Currents Award (for best first or second film) at this year’s Pusan International Film Festival, is one of the great discoveries one always hopes to find at a film festival, especially one with as vast a selection as Pusan’s. Opening with a cryptic image of two mudang (Korean female shamans) performing an elaborate ritual dance, “Land of Scarecrows” alternates between two locales: Honghae, a rural area of South Korea, and the Philippines. The film follows a number of characters, the three most significant being Jang Ji-young (Kim Sun-young), an amateur installation artist who also happens to be a transgender woman living as a man; Rain (Bich Phuong Thi), a young Filipina who dreams of living in Korea; and Loi Tan (Jung Duwon), an ethnic Korean young man who was brought from the Philippines as a foster child. A beautiful and lyrical alchemy, not dissimilar to the artworks Ji-young creates, brings these characters together and unites their destinies into a tapestry that is mesmerizing to watch. “Land of Scarecrows” melds humor, melancholy, and an ethereal sense of spirituality in a way that elevates it far above the sort of pretentious, self-consciously arty films that are far too prevalent at film festivals. The phenomenon of Korean men seeking arranged marriages with Southeastern Asian women is presented in a very humorous way, with repeated scenes of nervous potential brides being sized up by their suitors. Ji-young meets and marries Rain at one of these marriage agencies, of course with Rain initially being unaware that her new husband is a biological woman. Their relationship, however, isn’t played for laughs and in fact leads to some of the most poignant moments of the film. 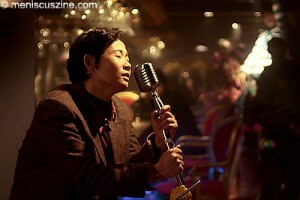 The film is also full of beautifully-rendered scenes that could stand alone as short films, such as Ji-young and Rain’s initial meeting, and a later scene in a karaoke bar where Ji-young belts out a plaintive, romantic song. Roh Gyeong-tae, a former stockbroker who previously made a number of experimental short films and the feature “The Last Dining Table,” emerges as a major talent with “Land of Scarecrows,” which has a richly textured look and an unusual approach to storytelling that yields great rewards. This makes it all the more gratifying that the New Currents jury, headed by French New Wave icon Anna Karina, recognized this extraordinary work. “Land of Scarecrows” shared the New Currents Award with a Japanese film, Masahide Ichii’s “Naked of Defenses.” Click here for more information about the film on the Pusan International Film Festival Web site.